Ultimate style and comfortable seating are yours in this 88" transitional style sofa. Features a high back with three semi attach back cushions over three box end cushions, arm accented with small nail head trim, front rail accented with larger nail head trim, all help turn this classic transitional style into a work of art. Contrasting throw pillows and kidney pillow with beautiful wooden sculptured legs add the finishing touch. The Benwood Upholstered Sofa by England at Jordan's Home Furnishings in the New Minas, Halifax, and Canning, Nova Scotia area. Product availability may vary. Contact us for the most current availability on this product. 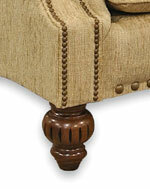 Arm Padded pillow arms with nailhead trim detail maintain the traditional styling of the collection. Seat Back Tight rolled seat back. Seat 3 seat cushions with nailhead trim detail on curved apron. The Benwood Collection offers comfortable seating and transitional styling. Strong accents and carved details represent the experienced craftsmanship in each piece. Padded rolled arms accented by nailhead trim detail, turned exposed wood legs, and tight rolled backs all create a distinctively warm and elegant style. Choose from your favorite colors, textures and patterns in special order fabrics, or mix and match leather and fabric in the correlating Loudon collection. Whether you want to relax in the comfort of your own home or inspire your guests, this collection will portray elegance and world-class design for a lifetime. The Benwood collection is a great option if you are looking for Traditional furniture in the New Minas, Halifax, and Canning, Nova Scotia area. 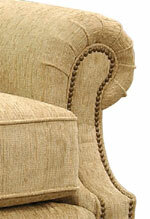 Rolled arm rests and nail-head trim. Browse other items in the Benwood collection from Jordan's Home Furnishings in the New Minas, Halifax, and Canning, Nova Scotia area.